As the Venice Festival launches the fall awards season, several unexpected candidates enter the race. Mel Gibson is not the first person who comes to mind among Oscar contenders. But advance buzz is growing on World War II drama “Hacksaw Ridge” (Lionsgate, November 4), his return to the director’s chair after “Apocalypto” 10 years ago. See the new trailer here. No matter how strong and resonant this true story turns out to be—it’s about a conscientious-objector medic (Andrew Garfield) who saves lives in the Battle of Okinawa without using a gun, and wins the Medal of Honor—the likelihood is slim of Gibson landing another Best Picture or Director nomination (he won both Oscars for “Braveheart” back in 1996, his only Oscar nominations). Too many Academy voters will never forgive his past behavior. But if the movie, which will debut out of competition at the Venice Film Festival (August 31 – September 10), is well received by critics and audiences, other people involved could rise to Oscar contention — most notably, Garfield. Gibson is a gifted filmmaker, despite his tendency to lean into uber-violence (which he reportedly does here). If his craftspeople deliver a fine work of cinema, they will be recognized, even if Gibson is ignored. 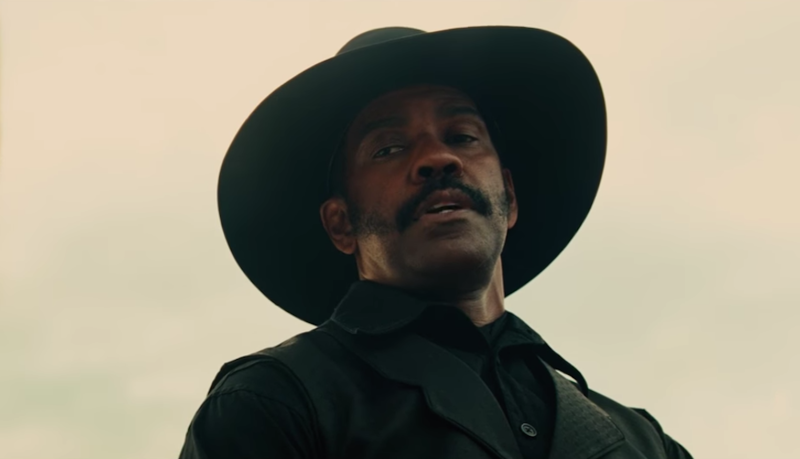 Sony is also positioning Antoine Fuqua’s Kurosawa-inspired frontier western “The Magnificent Seven” in the awards fray by debuting it as the closing-night film in Venice (out of competition), two days after its premiere at the Toronto Film Festival. The movie must be a crowd-pleaser. And Denzel Washington is an Oscar perennial, with six nominations and two wins. He’s also directing his own movie, “Fences,” adapted by August Wilson from his Tony-winning Broadway revival and co-starring Viola Davis, which comes out at year’s end. Finally, Terrence Malick’s 30-year exploration of the birth and death of the known universe, the VFX-packed 90-minute documentary “Voyage of Time” (distributed by Broad Green and narrated by Cate Blanchett), will be unveiled at Venice. (A 40-minute version narrated by Brad Pitt will hit IMAX screens on October 7.) Shot in exotic locations all over the world in multiple formats (HD, IMAX, Panavision, 35 mm, 65 mm, Super 35, Super Panavision 70, and 70 mm), the movie boasts 16 producers and a score by Ennio Morricone and Hanen Townshend. Other possible awards contenders in the Venice lineup include opening night title “La La Land” (Lionsgate, December 16), directed by Damien Chazelle (in competition) and starring Emma Stone and Ryan Gosling; tearjerker family drama “The Light Between Oceans” (DreamWorks/Disney, September 2) directed by Derek Cianfrance (in competition) and starring Michael Fassbender, Rachel Weisz and this year’s Oscar-winner Alicia Vikander, who is getting the most awards buzz; “Nocturnal Animals,” directed by Tom Ford, starring Oscar perennial Amy Adams, who also stars in Denis Villenueve’s Toronto entry “Arrival” (Paramount, November 11); and acquisition title “Jackie,” directed by Pablo Larrain, starring Natalie Portman as Jacqueline Kennedy in the aftermath of JFK’s assassination. Films may emerge from Venice that will be picked up for stateside release, often when they are likely foreign Oscar submissions, as well as documentary titles from the likes of Andrew Dominik (“One More Time with Feeling”), Sergei Loznitsa (“Austerlitz”), and Charlie Siskel (“American Anarchist”). Showing at Cinema In the Garden is James Franco’s latest, acquisition title “In Dubious Battle,” set during the ’30s farm-workers movement, and co-starring Selena Gomez and Bryan Cranston. One day, a Franco film will hit the zeitgeist (he has 36 credits including shorts, docs, and released and upcoming features).